We recognise that high quality food provides the fuel for our children to learn! Mealtimes are a social occasion in our nursery and staff role model table manners and positive behaviour during food service. 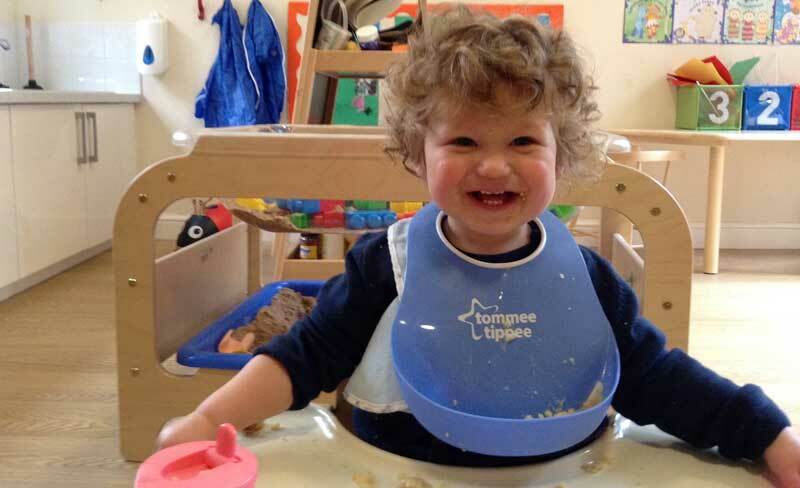 Children are supported to develop independent feeding skills and meal times are a happy and social time of the day. Children are provided with a balanced and healthy breakfast, mid-morning snack, lunch and tea on a rolling 5 week menu to ensure they have balanced and varied diet at nursery. Children have full tummies and are ready to learn! All food is sourced locally and freshly prepared daily in our on-site kitchen which has been graded with the highest rating of food hygiene (5 stars) from the government Food Standards Agency. We use H.G. Beards in Bramhall for all of our meat (they even make special low salt sausages just for us!) and Unwins for our fresh fruit and vegetables. We are keen that the children have opportunities to try new foods and tastes and include special menus for cultural festivals and celebrations throughout the year. Our children are involved in planning the menus via our monthly school council meetings in Pre-School and we encourage staff and parents to suggest new meals and recipes for our chef, Sarah which we then add to our menus periodically. We cater for a variety of individual dietary requirements, allergies and parental preferences. (Allergens are shown in red on the example menu below). Our menus are rotated on a five-weekly basis and planned using the Children’s Food Trust guidelines, ensuring that the children receive the most up-to-date nutrition as part of their healthy lifestyle. We have a comprehensive food and nutrition policy so that children are provided with a wide range of high quality produce in safe circumstances. Here is a sample menu from our 5 week plan. Our menus are displayed each day on our notice boards in the reception area of nursery as occasionally the weekly menus have slight variations due to availability of locally sourced food. BREAKFAST 8.30am-9.15am Weetabix with milk. Milk, Buttermilk, Oat, Wheat, Soya Rice Krispies with milk. Wheat, Soya, Nuts, Sesame seed, Egg Cornflakes with milk. Milk, Wheat, Celery, Barley, Gluten and Soya Mushroom and vegetable bake. Rice pudding served with dried fruit. Milk, Celery, Wheat, Egg Sausage, Mushroom and courgette carbonara. Vegetarian Option: Mushroom and courgette carbonara Meat loaf with new potatoes and salad. Vegetarian Option: Mushroom and vegetable loaf Creamy fish pie with sweet potato and minted peas. Jelly and fresh fruit salad. 3.30pm Soup with wholemeal bread. Humous on rice cakes with cheese and tomatoes. Vegetarian Option: Butterbean and sweetcorn pasta salad. Fish, wheat, gluten, milk. Homemade cheese and tomato pizza served with a side salad. Vegetarian Option: As above Pea and sweetcorn pasta salad. Vegetarian Option: As above excluding tuna sandwiches.